Microscale metallic rods with two dissimilar metal segments at opposite ends can exhibit bacteria-like movement as a consequence of electrophoretic effects when immersed in a chemical fuel, such as hydrogen peroxide. Previous work has demonstrated that platinum/gold microswimmers catalyze the oxidation and reduction of hydrogen peroxide at the platinum end and gold end respectively, generating a electroosmotic flow of protons that results in self propulsion with the platinum end leading. The movement of these artificial swimmers can be guided with teardrop shaped posts, fabricated by lithography, which allows the microrods to be concentrated or sorted by their speed. This provides information that could be applied to methods of organizing bacteria or other biological swimmers. The speed is influenced by varying the identity of the metals (gold/platinum or gold/rhodium) and their segment length. Gold/rhodium nanorods tend to have greater speed which can increase the effectiveness of the teardrop shaped posts guiding their motion. This project informs on the dynamics of artificial swimmers, and the influence of their environment on their motion, and the implications for their use in nanoscale drug delivery and understanding the behavior of natural organisms. Guiding microscale swimmers using teardrop-shaped posts. M. S. Davies Wykes, X. Zhong,b J. Tong, T. Adachi, Y. Liu, L. Ristroph, M. D. Ward, M. J. Shelley, J. Zhang, Soft Matter, 2017, 13, 4669-4800. 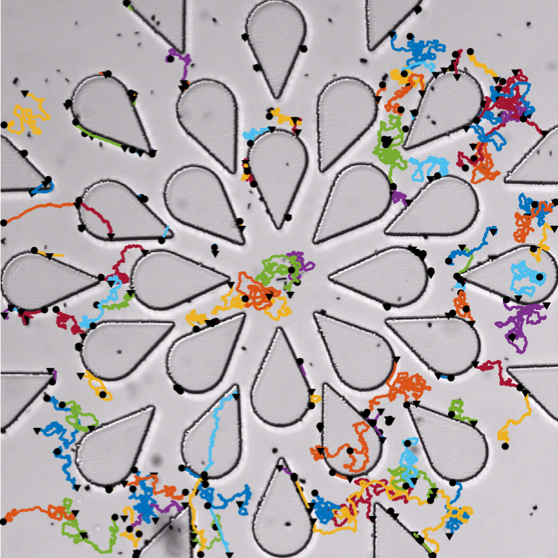 Dynamic self-assembly of microscale rotors and swimmers. M. S. Davies Wykes, J. Palacci, T. Adachi, L. Ristroph, X. Zhong, M. D. Ward, J. Zhang, M. Shelley, Soft Matter, 2016,12, 4584-4589. Crystallization under nanoscale confinement. Q. Jiang, M. D. Ward, Chem. Soc. Rev. 2014, 43, 2066-2079.